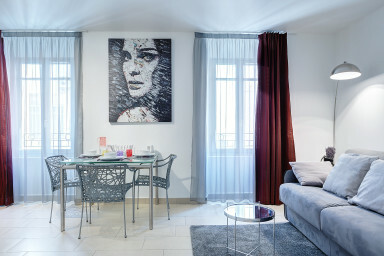 Renovated apartment 1 bedroom, near Cannes' port, quiet street and full of charm. Located in Cannes' center next to the Quai St-Pierre. Perfect for delegates (8 minutes walk from the Palais des Festivals) and tourists (5 minutes walk to the beach). This 1 bedroom apartment of 45 m², East exposed, is located on the first floor (lift), is equipped with WIFI and air conditioning. Maximum capacity : 4 people. A room is equipped with two singles beds with possibility of bringing them closer to make a double bed (scratch and a on-mattress available). There is a comfortable sofa bed in the living room. One bathroom, one separated WC, one fully equipped American kitchen ( oven, Nespresso, etc ...), one living room, flat screen. Enjoy a walk at sunset by the beach, close to your apartment. Die Wohnung verfügt zwar über keinen schönen Ausblick, ist dafür aber perfekt und hochwertig ausgestattet. Es hat uns an nichts gefehlt. Merci beaucoup ! City center, near the beaches and Palais des Festivals. Our accommodations are cleaned and prepared with love. Amenities of an apartment with the services of a hotel. IMMOGROOM offers you a property management service to rent your property in complete safety and simplicity. Our seasonal rental agency offers you to rent your property in Cannes (occasionally or on a long-term basis) in order to make your property profitable by providing you an additional income. Our Airbnb agency based in Cannes takes care of all the property management of your apartment or villa: photo shooting, creation and diffusion of your property listing, Airbnb price rental optimization, reception of the travellers, cleaning, bedding, payment of your rental property revenue etc. © 2019 www.immogroom.com. All rights reserved.